Dayr Sunayd is located in the middle of Gaza District, south of al-Majdal, west of Simsim, as shown on the map. 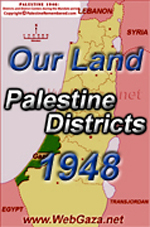 There are no Israeli Settlements on Dayr Sunayd village lands. The settlement of Yad Mordechai was established just to the north of village lands. A railroad bridge, unused segments of track, and three of the train station’s buildings are all that remain of Dayr Sunayd. The station’s buildings are deserted and in a state of deterioration. This entry was posted in Palestine 1948 and tagged Dayr Sunayd. Bookmark the permalink.